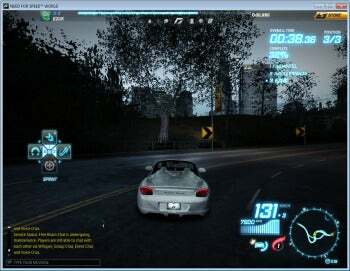 Need For Speed World (free) is a massively-multiplayer online racing game first released in 2010 by Electronic Arts. As befitting the long-running Need For Speed franchise, Need For Speed World features beautiful graphics, dozens of cars, and copious amounts of action. Race against players from around the globe in Need for Speed World. You can race against other players from all over the world, participate in single-player events where you dodge the cops in crazy urban car chases, gain in rank, and buy new vehicles. Need For Speed World lets you buy in-game SpeedBoost for real-world money, and then use the SpeedBoost to buy cars and other items, but you don't have to buy SpeedBoost to have fun and level up. You will need to log into the Need For Speed servers every time you start the game, and the game does not offer to remember your password, which can be annoying at times. Nevertheless, the game is very popular; the vendor even threw it an anniversary party earlier this year. Note: The Download button takes you to the vendor's site, where you can play this Web-based software.